My friend Caroline is having a baby boy this month. Any minute now, really. My friend Aja and I decided to host a brunch for Caroline a few weeks ago so that she could have a little girl time before the new little bundle of joy arrives. Brunch=quiche, right? Well, we thought so. Me: What do you want to work on? Me: Great! So you'll make the crust and I'll make the filling. Aja: *rolls eyes and grunts* fine. Aja no longer has a fear of making crust. In fact, I would venture a guess that she could show you exactly how to make crust! Crust is scary until you've made it. The key points are: use very cold, very good ingredients, don't overmix the dough, and let your dough rest. It's really not that hard. And it is SO worth the small amount of effort required. I am not above occasionally using a Pilsbury roll-out crust, but you just can't buy it this good. You will be happier with a homemade crust every time. Having tested the recipe and found ourselves to be competent quiche-makers, Aja and I set out the next weekend to make a quiche lorraine and a smoked tomato and spinach quiche. We used my stovetop smoker to smoke the tomatoes and sauteed the spinach with a little shallot and olive oil. The quiche lorraine was straight out of Bouchon. They were both beautiful and delicious, and I strongly recommend that you make at least one of them and have your friends over for brunch! I know that, when you look at this recipe and see the length of the instructions for the crust, you'll think it looks hard because they are so very long, but trust me...it's just very specific. It is easy, just try it. Place 1 cup of the flour and the salt into the bowl of a stand mixer fitted with the dough hook. Turn the mixer to low and add the butter one small handful at a time. When all of the butter has been added, increase the speed to medium and mix until the butter is completely blended with the flour. Reduce the speed and add the remaining flour, mix just to combine. Add the water and mix until incorporated. The dough will gather around the paddle and should feel smooth, not sticky, to the touch. Pat the dough into a disc and wrap in plastic wrap and let the dough rest in the refrigerator for at least one hour and up to 24. Brush the inside of a 9-inch cake pan with canola oil and place it on a baking sheet. The baking sheet will catch any little pieces of crust that fall off and will keep your house from being filled with smoke. Place the dough on a floured work surface and sprinkle flour over the dough. Use a floured rolling pin to create a circle about 14 inches in diameter. While you roll the dough out, you must constantly move it. Roll once, then turn the dough circle, roll again, turn the dough, etc... This will keep the dough from sticking to the countertop. To move the dough from the countertop to the pan, place the rolling pin across the dough about a qaurter of the way up the circle and gently roll the dough circle onto the pin. Lift the rolling pin, move the dough to the pan, and unroll it over said pan. Gently tuck the dough into the edges of the pan, trying not to tear it, but don't worry too much if you do tear the dough, because you can just patch it with a little extra dough. Trim any dough that hangs more than an inch over the side of the pan and reserve it for patching. Fold the excess dough over the sides of the pan so that it drapes all around the edges of the pan. The draping dough will help keep the crust from shrinking too much as it bakes. Place the pan with the dough into the refrigerator to rest for about twenty minutes. In the meantime, preheat the oven to 375. Line the raw quiche shell with parchment paper, and fill the paper-lined crust completely with pie weights, dried beans, or uncooked rice. Bake the shell for 35-45 minutes, until the edges of the shell are lightly brown but the center is still light in color. Remove the parchment and weights and check for holes or cracks. Patch as needed with reserved dough. Bake for another 15-20 minutes without the weights and parchment until the shell is a deep golden brown. Remove the shell from the oven and allow to cool completely before filling it. Combine the milk and cream over medium heat in a medium saucepan until scalded (a skin begins to form on the surface). Remove from the heat and let cool for 15 minutes before continuing. Combine all custard ingredients in a large bowl and mix well with an immersion blender. If you do not have an immersion blender, you can mix the custard in batches in a regular blender. Scatter the bottom of the cooled quiche shell with broccoli florets, about 1/2 cup of cheese and half of the apple slices (or whatever other filing you like!). Top with half of the custard mixture. Top with the remaining broccoli and apples and another 1/2 cup cheese, the add the rest of the custard mixture, and top with the remaining 1/2 cup of cheese. Bake the quiche at 325 degrees for 1 1/2 to 1 3/4 hours, until the top of the quiche is browned and the custard is set. If you jiggle the pan, the middle of the quiche should not appear to be too loose. Remove the quiche from the oven and allow to cool completely. Once the quiche is cooled, remove the excess crust around the edges of the pan with a serrated knife. Enjoy at room temperature or re-warm one piece at a time in a 375 oven for about 10 minutes. I love to bake. I find it comforting: losing myself in the measuring of ingredients, careful kneading and shaping of dough, and the satisfying feeling of removing a (hopefully) beautiful pan of goodies from your oven that will (hopefully) last at least a few days. This love of baking, by the way, is in direct conflict with my borderline-obsessive need to have a clean kitchen and the fact that I have black countertops. The conflict, however, is balanced out nicely by the fact that I can almost always bake something without having to make a trip to the grocery store. A trip to the grocery store with two small children, in case you didn't know, is kind of an ordeal when said children may not have any inclination whatsoever to go to the store, unless they happen to remember that the store has free samples of cookies and also that the store is next to the big Shrek billboard. ("Do you see Shrek? Hi, Shrek!") All of that said, my desire to avoid unnecessary trips to the store regularly results in recipe substitutions that don't always work. This time, though, they worked beautifully. A recent conversation I had with a friend got me thinking about how I want to be an expert scone baker. I frequently have such thoughts, picture the little thought bubbles: I want to be an expert at making sourdough bread, I want to be an expert at making biscuits, I want to be an expert at mollecular gastronomy, I want to be an expert at building bridges...well, you understand. The thoughts come and go, and I don't always put my "I want to be an expert" thoughts into action, but today I did. And do you know what I found out? This recipe makes scones seem like the easiest thing ever! Seriously, I was upstairs pretending to take a nap and looking at facebook when, just about forty-five minutes before my kids would be waking up from their own naps, I clapped the laptop closed and ran downstairs to make scones. The first recipe I thought of was Molly Wizenberg's, from her book, A Homemade Life, which my friend Aja recently lent me (with the instruction that I had to return it, as it was not hers to begin with. Also, she said "You are this girl." This girl and I have a lot of things in common, but unfortunately her intimate knowledge of Paris is not one of them.) I have had the book for less than two weeks and have already made three of her recipes. (these scones, the tarte tatin, and the roasted cauliflower with salsa verde) Luckily for me, all of the recipes from the book can be found on Wizenberg's blog. I guess I will go ahead and give the book back. Pout. Please forgive the constant substitutions. See, I wasn't kidding about all of the substitutions. I used half white and half whole wheat flour, because whole wheat equals healthy, but using only whole wheat flour will make an already slightly dense scone weigh approximately four pounds. I did not have any half and half, so I used milk mixed with an extra yolk to boost the fat content so that the milk would more closely resemble half and half. I also used milk mixed with an egg yolk for the glaze, for the same reason. I substituted a tablespoon of ground ginger for the crystallized ginger, and added an extra tablespoon of sugar to make up for the sugar that would be missing from the crystallized ginger. OK, Preheat your oven to 425 degrees. In a large bowl, whisk together your flours, baking powder, and salt. Using your hands, rub the butter into the flour mixture, squeezing and pinching with your fingertips until the mixture resembles coarse meal and there are no butter lumps left larger than a pea. Add the sugar, lemon zest, and ginger and whisk to combine. Pour the 1/2 cup of milk, the egg, and the egg yolk into a small bowl and mix with a fork until combined. Pour the egg mixture into the dry ingredients and stir gently with the fork to combine. Don't worry about incorporating every little last bit of flour in the bowl. Just mix to combine. Over-mixing will lead to tough scones. Turn the ingredients in the bowl onto a lightly floured surface, such as your counter, and press and knead the mixture into a circle about one inch thick. Don't knead it too much, just until it stays together in that one inch thick circle. Cut the circle into eight wedges. Mix the remaining egg yolk with a splash of milk and brush the mixture lightly onto each scone. If you had some raw sugar lying around, you could sprinkle some on top of each scone to make them pretty. Place the wedges onto a parchment or silpat-lined baking sheet and bake for 10-14 minutes, until lightly browned. The scones are done when you tap on the bottom of one and the sound is a bit hollow. The scones will be best eaten within a couple of days of making them. For keeping them longer than that, freeze them in a ziplock. Thaw and toast, serve with butter. This dish is so low-brow that I didn't even bother to put it into a real dish before photographing (or eating) it. We had hot wings on Super Bowl Sunday, of course. There were a few leftover, and I can't bear to waste anything these days, so... I looked in the fridge. Leftover pasta from a dinner of broccoli and shells (and lots of pecorino romano- yum! ), leftover chicken wings, leftover blue cheese dressing (homemade, of course! )...celery and carrots...pasta salad! Sounds totally wierd, I know, but trust me. If you like hot wings, you'll like this! It has the same addictive quality- nice and salty, a little spicy, a little creamy, blue cheesy, and vinegary. Certainly not my most elegant creation, but definitely tasty! Recipe? Just pick your chicken wings clean and add the meat to cooked pasta. Toss with finely diced carrots, finely diced celery, blue cheese dressing, and Frank's Red Hot! My one and a half year-old daughter demanded seconds of this dish. Really. It began as a pork roast I made a few nights ago for Chad and the kids to eat while I was at work. I heard she ate her pork like crazy, but of course she liked the applesauce even better. Fast forward a couple of days, and there is half of a roast sitting in my fridge. What to do? We had planned on turning the rest of the roast into BBQ sammies, but that just wasn't quite challenging enough: slice pork, add barbecue sauce, heat. 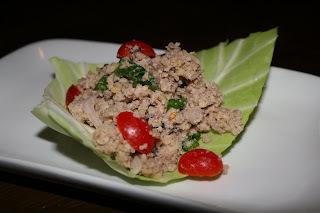 So, I consulted one of my favorite cookbooks, Quick & Easy Thai, and found a recipe for lahp moo, a pork sort-of-salad reminiscent of larb. The recipe was written for ground pork, which of course was to be cooked as part of the recipe, and not already roasted beforehand. I decided the roast would turn thai. I put the roast (cover eyes and press on) into the food processor and ground it up. The deed was done, and we would have no barbecue sandwiches for dinner. In my enthusiasm (it's working! ), I left the food processor on a little teeny bit too long, so my pork was a little too ground up for my taste, but the end result was delicious anyway. All of the thai flavors I love were there: the sweet, salty, the spicy, and the sour. Don't toss your leftovers, people! The approximate recipe for this dish: Grind up your leftover pork roast in the food processor*, but not too much! You want it to look about like cooked ground beef, texture-wise. Season with the juice of two or three limes, a couple of tablespoons of fish sauce, a couple of tablespoons of sugar, crushed red pepper to taste, chopped mint, chopped green onions and a couple of tablespoons of thinly sliced shallots. Toast a few tablespoons of raw rice in a dry skillet over medium high heat until it begins to turn golden brown. Process the rice until it is pretty fine, and toss it into the pork mixture. Serve with chopped tomatoes and cabbage leaves, and of course some sriracha on the side! *If your pork looks a little too fatty (mushy), then try putting it into a frying pan with a tablespoon or so of hot oil and cooking it for a few minutes. We always had a tacky Christmas tree growing up- I mean really tacky, just how I like it. We used multi-colored lights, garlands of both silver and gold, lots of shiny ball ornaments, tinsel, and candy canes. I think I even remember adding a few popcorn strands to that mess one year. Well, I love nostalgia, and I love a good tacky Christmas tree, so I still tend to follow my old family tree-decorating traditions. We forgot the tinsel this year, sadly, but not the candy canes! The problem is, what to do with all of those candy canes when Christmas is over? I usually put them in a bowl by the front door in the hopes that someone will eat them, but inevitably end up throwing them away after a month or so. Not this year! I believe I have started a new tradition for our little family- peppermint ice cream! What better way is there to avoid being wasteful and still have a tacky tree than to smash your leftover candy canes to smithereens and pour them into homemade ice cream, I ask you? Ice cream is simple to make at home as long as you have the proper equipment. I always keep my ice cream maker in the freezer, because I am sort of a last-minute cook: I rarely plan my culinary adventures in advance, and the ice cream maker takes fifteen hours to chill. I use basically the same recipe for all of my homemade ice creams, and just tweak the flavors to suit my mood and ingredients. This recipe is half and half cream & pet milk, mainly because I had the pet milk in my pantry and preferred to use that than to use up all of my daughter's milk. You could use whole milk in place of the evaporated milk, or you could just omit the milk altogether and use all heavy cream. You will get basically the same end result with any of the above combinations, with just slightly varying levels of richness. Combine milk, cream, and sugar in a medium sauce pan and stir to combine. Cook over medium heat until the sugar is dissolved and the liquid has almost come to a boil. Slowly pour about half of the liquid into the egg yolks, stirring all the while. Then pour the egg mixture back into the saucepan with the remaining liquid and cook over medium heat, stirring occasionally, until the mixture coats the back of a wooden spoon. Add the extract and stir to combine. Pour the mixture through a sieve and into a bowl set over an ice-water bath. Stir with a whisk to chill. Once the mixture is cold, follow the instructions for your ice cream maker and chill in the freezer. Serve with hot fudge sauce. Note: I added a few drops of "soft pink" gel food coloring to my ice cream to make it pink, but you could leave it out or substitute a few drops of plain ole red food coloring if you like. Heat all ingredients except the sugar in a medium sauce pan over medium-high heat until melted and smooth. Remove the pan from the heat and stir in the sugar until melted and smooth. Enjoy! I went to the grocery on Tuesday to stock up on a few items because snow was predicted for today in Memphis, and goodness knows that Memphians completely lose track of their senses when they think there is going to be weather. I successfully avoided the snow crowds at the grocery (don't get me started on the midtown Schnuck's) and made it home with my fryer, intended for Zuni chicken, one of our favorite dinners. Chad came home for lunch, however, and casually mentioned that he might like to have chicken pot pie sometime (picture light bulb over head), so I decided to go with that. Aren't I just a good little wife? The sauce for this recipe starts with bacon. Bacon makes everything good. I used the drippings from the bacon to cook the vegetables, then added flour to thicken the sauce, which was eventually made from the fryer I got- a carrot, half an onion, a few cloves of garlic, a rib of celery, some peppercorns and water to cover, cooked for a couple of hours=stock and boiled chicken. Two birds, one stone! No pun intended. Anyway there was only one bird, but I digress. Added the stock to the flour and vegetables, thickened with a buerre manie (pronounced burr monyay) and topped with pastry...voila! Chicken pot pie! I used only a top crust, and I think it was just the right amount of pastry for this recipe. You could certainly do a bottom crust if you like, just double the recipe for the pastry and blind bake the bottom crust. Shortcuts: use canned stock and store-bought pie dough (gasp!). On pie crust: if you have a food processor, it really is easy. Just have your ingredients measured out before you begin. You'll feel like a pro in no time. You can use all butter if you are queasy about shortening- the shortening just makes the crust easier to deal with. First make the stock. Place the first 7 ingredients in a large pot and fill with water to cover. Bring to a boil, reduce the heat and simmer for a couple of hours. Season to taste with salt. Strain the stock through a sieve and discard all except the chicken. Take the meat off of the chicken bones and set aside 2 cups for the pot pie. Save any extra meat for chicken salad! Make the pastry: In a food processor, pulse the flour and salt and sugar to combine. Scatter the butter and shortening over the flour mixture and pulse a few times until it looks like coarse meal. With the motor running, add the cold water and process until the crust starts to pull away from the sides of the bowl. Take the dough out and press it into a disk and wrap in plastic wrap, then let it rest in the fridge for an hour. Make the filling: In a large saute pan over medium-high heat, cook the bacon until just crispy. Remove to a paper-towel-lined plate and let drain. Chop the bacon when it is drained. In the meantime, cook the onion and celery in the bacon drippings until softened. Add the carrots and cook for a couple of minutes more. Sprinkle two tablespoons of the flour over the cooked vegetables and stir to coat the vegetables. Add the warm stock and stir to combine. Let the remaining stock cool off a little and then pour into ziplocks to store in the freezer for future use. Using a fork, combine the remaining two tablespoons of flour with the softened butter to make a buerre manie. Stir the buerre manie into the sauce and bring to a boil, cook until thickened. Add the frozen peas and the chicken. Season to taste with salt and pepper. Pour the mixture into a pie pan. Use a rolling pin to roll out the pastry into a circle just slightly larger than your pie pan. Roll the crust onto the pin and unroll it over your pie pan. Crimp the edges of the pastry onto the pie pan. Brush the pastry with the egg wash and cut a few slits in the center of the pastry to allow the steam to vent. Bake for about thirty minutes, until the pastry is golden brown. Check your pie about halfway through. If your edges start to get too brown before the center of the pastry is done, cover them with tin foil. Let the pie rest for about ten minutes before cutting into it. Enjoy!